About $2.2 billion is needed to address the housing deficit in Ghana and this could be achieved only through private public partnership, Alhasan Andani, Managing Director of Stanbic Bank Ghana, has stated. 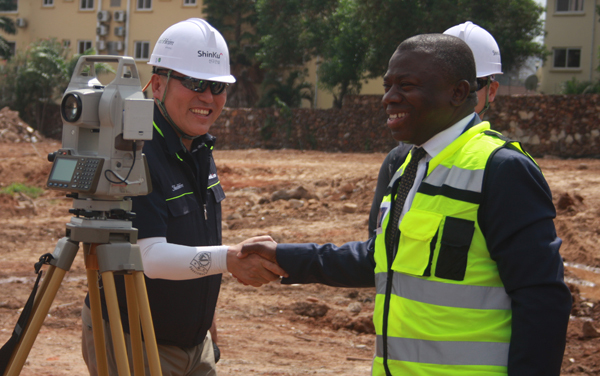 Mr Andani, who was speaking at a ceremony to cut the sod for construction of the SKYVILLE premium apartment project at the site of the former Shangri-La Hotel yesterday in Accra, said government alone cannot provide the 1.7 million housing units, adding that the country needs 170,000 houses a year to bridge that gap. The SKYVILLE Premium Apartment Project estimated at $200 million is a 297 multi-purpose apartment project. It would include residential homes, exclusive branded shops, restaurant, cafeteria, fitness center, swimming pool and state-of-the-art Kassardjan office complex. The project, initiated by KO&G, a Korean firm together with Ghanaian development firm Armen Kassardian, its strategic partner, spans a 150,000 square meter land at the former Shangri-La Hotel. The project has Shinku Construction Company, a Korean construction firm and Stanbic Bank as its contractors and bankers respectively. Mr Andani added that the project, which is expected to be completed in 30 months, would offer part of the 170,000 houses that are required per year. “I’m absolutely sure that when this project is finished, any expatriate that we invite from any part of the world will come and see something that is world-class and of course the input into the economy is what will generate a lot more resources so that we can continue to provide accommodation to fill the housing deficit,” he noted. Jojo Dines Clint, Chief Executive for KO&G, disclosed that the project would create over 1,000 direct and indirect jobs over the construction period and over 300 post-construction jobs. “KO&G is an establishment with the core aim of providing luxurious but quality, unique and affordable infrastructure for prospective investors and home-owners alike. In Korea, we have provided funding to major construction companies in partnership for commercial and residential developments and we are happy to set up in Ghana with our premium luxury brand SKYVILLE,” Mr Clint said. He urged investors to take advantage of the numerous opportunities in the housing industry. “There is a saying that you don’t wait and buy real estate but you buy and wait,” he added.